Einstein could never accept that the universe was at its heart a cosmic crapshoot. He spent years searching for a unified field theory to no avail. But the puzzle he tried to solve is utterly fundamental. In simply recognizing the problem, Einstein was so daringly far-sighted that only now has the rest of physics begun to catch up. Today, theoretical physicists have succeeded in constructing a framework that offers the best hope yet of integrating gravity with nature’s other fundamental forces. This framework is popularly known as string theory because it postulates that the smallest, indivisible components of the universe are not point-like particles but infinitesimal loops that resemble tiny vibrating strings. 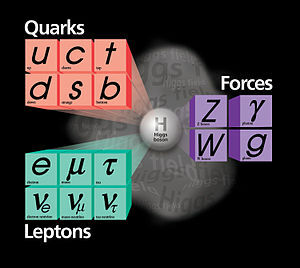 The behavior of all of these particles and forces is described with tremendous precision by the Standard Model, with one notable exception: gravity. For technical reasons, the gravitational force, the most familiar in our every day lives, has proven very difficult to describe microscopically. This has been for many years one of the most important problems in theoretical physics– to formulate a quantum theory of gravity. In the last few decades, string theory has emerged as the most promising candidate for a microscopic theory of gravity. And it is infinitely more ambitious than that: it attempts to provide a complete, unified, and consistent description of the fundamental structure of our universe. (For this reason it is sometimes, quite arrogantly, called a ‘Theory of Everything’). The essential idea behind string theory is this: all of the different ‘fundamental ‘ particles of the Standard Model are really just different manifestations of one basic object: a string. How can that be? Well, we would ordinarily picture an electron, for instance, as a point with no internal structure. A point cannot do anything but move. But, if string theory is correct, then under an extremely powerful ‘microscope’ we would realize that the electron is not really a point, but a tiny loop of string. A string can do something aside from moving— it can oscillate in different ways. Just as the strings on a violin or on a piano have resonant frequencies at which they prefer to vibrate—patterns that our ears sense as various musical notes and their higher harmonics—the same holds true for the loops of string theory. But rather than producing musical notes, each of the preferred mass and force charges are determined by the string’s oscillatory pattern. If it oscillates a certain way, then from a distance, unable to tell it is really a string, we see an electron. But if it oscillates some other way, well, then we call it a photon, or a quark, or a … you get the idea. So, if string theory is correct, the entire universe is made of strings! Far from being a collection of chaotic experimental facts, particle properties in string theory are the manifestation of one and the same physical feature: the resonant patterns of vibration—the music, so to speak—of fundamental loops of string. The same idea applies to the forces of nature as well. Force particles are also associated with particular patterns of string vibration and hence everything, all matter and all forces, is unified under the same rubric of microscopic string oscillations—the “notes” that strings can play. One way to think about this is to consider the periodic table of elements; each element has an atomic weight (based on average mass of atoms) and an atomic number (based on protons). It then follows that these numbers are comprised of various combinations and oscillating patterns of strings. Replacing particles with strings eliminated at least one problem that had bedeviled scientists trying to meld general relativity and quantum mechanics. This difficulty, in large part due to Heisenberg’s Uncertainty Principle, arose because space lacks smoothness below subatomic scales. When distances become unimaginably small, space bubbles and churns frenetically, an effect sometimes referred to as quantum foam. Pointlike particles, including the graviton, are likely to be tossed about by quantum foam, like Lilliputian boats to which ripples in the ocean loom as large waves. Strings, by contrast, are miniature ocean liners whose greater size lets them span many waves at once, making them impervious to such disturbances. Nature rarely bestows gifts on scientists, however, without exacting a price, and the price, in this case, takes the form of additional complications. Among other things, string theory requires the existence of up to seven dimensions in addition to the by now familiar four (height, width, length and time). It also requires the existence of an entirely new class of subatomic particles, known as supersymmetric particles, or “sparticles.” Moreover, there isn’t just one string theory but five. Although scientists could rule out none of them, it seemed impossible that all of them could be right. It should also be said that, to date, there is no direct experimental evidence that string theory itself is the correct description of Nature. This is mostly due to the fact that string theory is still under development. We know bits and pieces of it, but we do not yet see the whole picture, and we are therefore unable to make definite predictions. The key test of a scientific theory is whether its consequences agree with the measurements taken in experiments. In recent years many exciting developments have taken place, radically improving our understanding of what the theory is. Yet much more evidence is required. These developments may be in the theory itself, such as new methods of performing calculations and deriving predictions, or they may be advances in experimental science, which make formerly ungraspable quantities measurable. As we look back in time, music theory started in the sixth century BC with Pythagoras. His followers carried on his knowledge and tradition, although little was written down. The Pythagoreans believed that all matter emanated musical tones. However they were at a level where we couldn’t hear them. Pythagorean followers constructed an Earthly model based upon musical tones. The Pythagorean philosophy was based upon numbers and music. Pythagoras is credited with the creation of the musical scale. His concept is that the Moon is the closest body and should correspond to the shortest string and Saturn is represented by the longest string of the lyre. Some looked for the harmony of the universe blindly in the planets while others looked to the stars. Aristotle wrote of the harmony of the spheres, and the formation of the Perfect System. If you want to learn more, I highly recommend the popular science book “The Elegant Universe: Superstrings, Hidden Dimensions, and the Quest for The Ultimate Theory”, written by Prof. Brian Greene, a well-established string theorist.